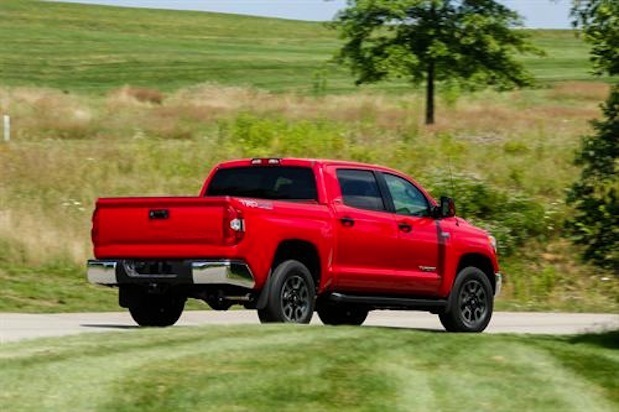 The newly-redesigned 2014 Tundra full-size truck will offer value-driven prices that reflect an overall decrease when it goes on sale this month. Toyota has released pricing on the all-new 2014 Tundra full-size pickup and it’s competitively priced for 2014 and even gets some price decreases. Pricing starts at $25,920 for the SR grade 4x2 Regular Cab. The most popular model is the SR5 and it has a MSRP of $29,465. The newly-refreshed Tundra also comes in the well-appointed Limited ($36,940) and two premium grades: “Platinum” and the all-new “1794 Edition.” both starting at $44,270. 2014 Tundra comes in a new five-grade strategy and features three cab styles, two-door Regular Cab, four-door Double Cab and four-door CrewMax, all available in 4x2 and 4x4. Because the Tundra is so customizable, the pricing structure is far from simple. But each grade comes equipped with a vast array of standard features. In a surprising statement made by Toyota, they say pricing for the 2014 Tundra actually reflects an overall average decrease of $263, or 0.7 percent. These new prices are based on comparisons between the new grade strategy for 2014 models and 2013 models with comparable equipment levels. Toyota says the new 2014 Tundra SR5 grades equipped with a 5.7-liter V8 engine will be unchanged from equivalent volume-leading 2013 models and will even add $650 worth of additional standard equipment. Where Toyota gets the price decrease comes in the Limited CrewMax 4x4 models that have been reduced $2,000 from equivalent 2013 models (4x2 models reduced by $1,990). Also all Platinum and 1794 Edition premium grade MSRP’s are reduced by $850 from equivalent 2013 models. Both the Platinum and 1794 Edition share the same MSRP ($44,270), allowing consumers to simply choose the premium grade they prefer. Both Platinum and 1794 Edition CrewMax 4x4 grades equipped with a 5.7-liter V8 top out at $47,320. Because the Tundra is so customizable, the pricing structure is far from simple and each grade comes equipped with a vast array of standard features. Toyota says the 2014 Tundra is the only truck in the full-size pickup segment to include a standard back-up camera (viewed from the audio display screen), and standard Bluetooth and audio streaming on all grades. From there all Tundra models get standard windshield wiper de-icer, front and rear mudguards, power window and door locks, and heated, power, outside mirrors. A Tow Hitch is also standard equipment on models equipped with the 5.7-liter V8 engine. The Limited, Platinum and 1794 Edition all get additional upgrades depending on trim levels. The new 2014 Toyota Tundra full-size pickup remains a good value and makes a good argument for American truck buyers to take a look.